There is a sort of Poor-House, where formerly a woollen manufacture was attempted, but, not being found to answer, it was discontinued, and for the last 6 or 7 years no master has been kept, and such Poor as cannot procure a residence elsewhere are put in the house, with an allowance to support themselves. There are 70 regular and 30 casual out-pensioners. The accounts were formerly kept on loose paper, most of which were in the possession of a person who became insane, and destroyed them. 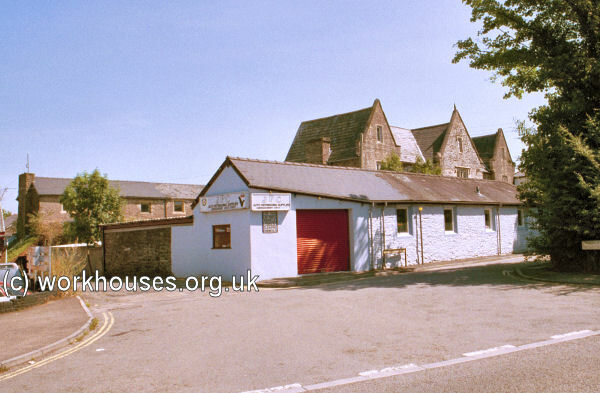 In 1835, a workhouse was in operation in the town on Mill Street with Richard Cross as its Governor. County of Monmouth: Abergavenny with the hamlets of Hardwicke and Lloyndir (3), Aberystruth (3), Bettwsnewydd, Bryngwyn, Bwlch Trewyn, Clytha, Lower Cwmyoy, Upper Cwmyoy, Ishlawrcoed with Manmoel and Ushlawrcoed (4), Llanarth, Llanellen, Llanfoist, Llangattock-Llingoed, Llangattock-nigh-Usk, Lower and Higher Llanover (2), Llansaintfraed, Llanthewy-Rhytherch, Llanthewy-Skirrid, Llantilio Pertholey, Llanvair Kilgidin, Llanvapley, Llanvetherine, Llanvihangel Crucorney with Penbiddle, Llanvihangel-nigh-Usk, Llanwenarth Citra, Llanwenarth Ultra, Oldcastle, Tewddog. Later Addition: Fwthog (from 1891). The population falling within the Union at the 1831 census had been 30,427 with parishes ranging in size from Llansaintfraed (population 24) to Tredegar's combined parishes of Ishlawrcoed with Manmoel and Ushlawrcoed (10,637). The average annual poor-rate expenditure for the period 1833-35 had been £6,817 or 4s.6d. per head. In 1849, the western part of the Abergavenny Union separated to form the new Bedwellty Union. 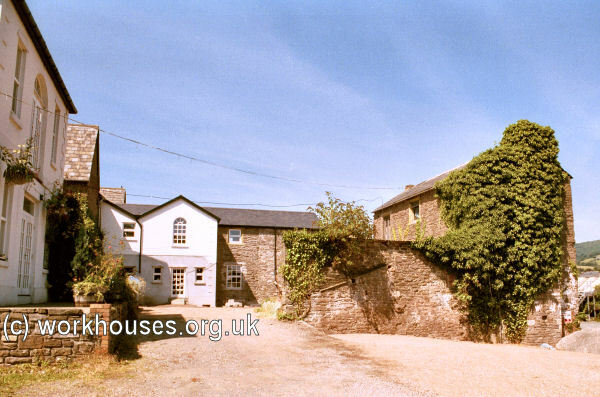 The Abergavenny Union workhouse, for up to 150 inmates, was built in 1837-8 on a site to the west of Abergavenny, at the east side of what became Union Road. 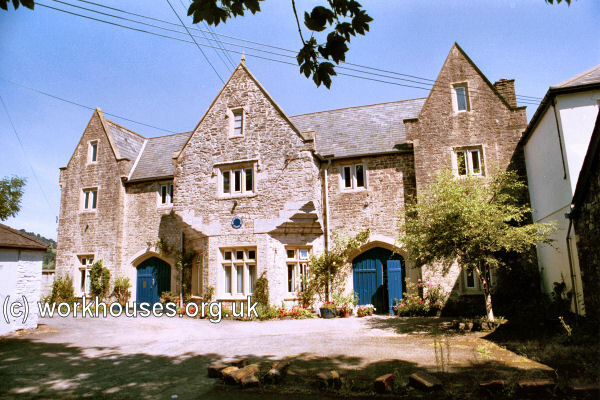 The architect was George Wilkinson who designed many other workhouses in England, Wales and Ireland, including the nearby one at Chepstow. His design for Abergavenny was based on the popular "square" layout. The workhouse location and layout are shown on the 1901 map below. Abergavenny general view from the south, 2000. The entrance block lay at the south-west. It was built in a plain Elizabethan-style, typical of Wilkinson's designs. 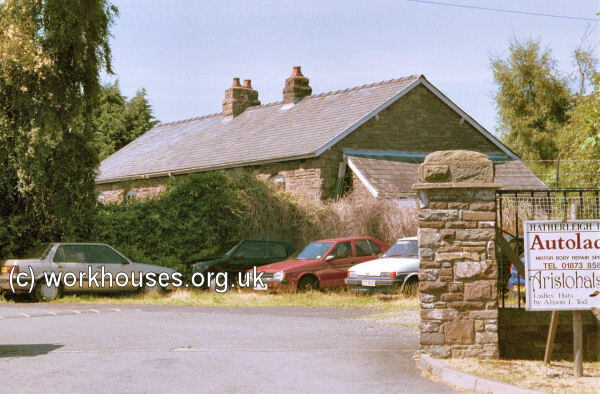 Abergavenny entrance block from the south-west, 2000. To its rear were two parallel accommodation blocks connected by a central spine. 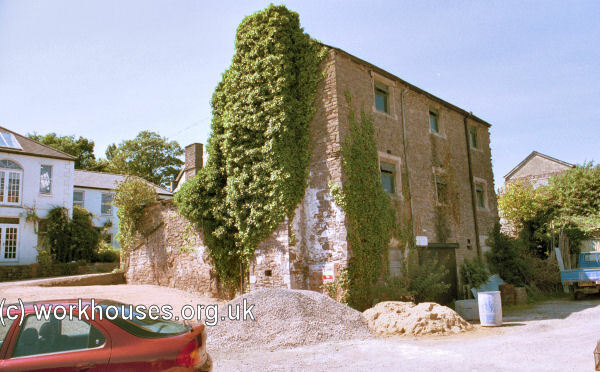 Abergavenny rear of entrance block from the south-east, 2000. Abergavenny from the east, 2000. A separate infirmary block was added at the north-east of the workhouse. Abergavenny infirmary block from the south-east, 2000. The accommodation for the ordinary sick is, I believe, sufficient, though the wards are for the most part inconveniently low. The ordinary female sick occupy a detached building. The provision for foul and infectious cases is unsatisfactory, as there never has been sufficient distinction in this union workhouse between the receiving wards, the foul wards, and the vagrant wards. There is a male vagrant ward to the right of the entrance-gate, and there is a small (so-called) male receiving ward without fireplace in the yard to the right of the entrance, but the male itch or foul ward is situated in the yard, on the female side, to the left of the entrance. There is a female foul ward in that yard, but there is no distinct female receiving ward, and no female tramp ward. I have recommended the Guardians to appropriate one of the wards in the yard to the left of the entrance as a female receiving ward, to erect a female tramp ward in that yard, and to erect a male foul ward in the men's yard to the right of the entrance. This would render it possible to comply with the regulations... respecting paupers on admission, which are not now duly observed, and would prevent the indiscriminate employment of wards as foul, vagrant, and receiving wards, which has been in practice in this union. 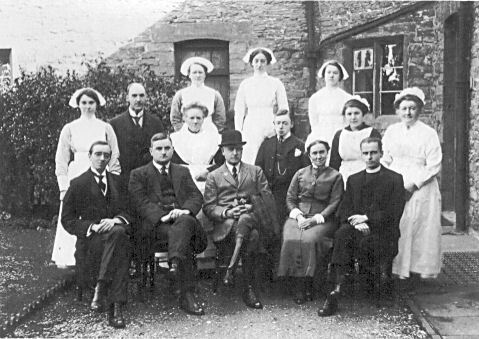 In around 1914, William and Rose (née Hoare) Williams were the Master and Matron of the Abergavenny workhouse. Their grand-daughter Veronica McKenzie has kindly provided a picture of them with the workhouse staff, and the Union's chairman, clerk, and chaplain. The former workhouse site later became known as Hatherleigh Place. The surviving parts of the building are now (2000) occupied by a variety of small businesses. One of these is a hat-makers — interestingly, hat-making is said to be one of the work activities performed by inmates in the workhouse. Gwent Archives, Steelworks Road, Ebbw Vale NP23 6DN. Holdings comprise: Guardians' minute books (1836-1930); Admission/Discharge registers (1843-1914); Creed Registers (1868-1911, incomplete); Register of Deaths (1836-1893); Notices of Death (1924-1928).